The museum was on the phone. "My colleague recommended you," he explained. "We're looking for somebody who can give a talk about museum language in a light, humorous way at our colonnade bar event this summer." I have this unfortunate tendency to get enthusiastic very quickly, so that's what I did: "Awesome!" I said, "I just wrote a little piece about the word 'important'!" "Splendid," he answered, "We can't pay much but since you already wrote it..."
Two weeks later I get an email: Would it also be possible for me to do the talk in June instead of July? I can't do June, I write back and decide to give him a call to see what's up. "How unfortunate," he says with an air of gravity, "but for July we now managed to get some 'hochkarätige" (top class) guests: an actor and the director of Frankfurter Allgemeine Zeitung!" My enthusiasm can rise but also drop drastically and that's what it did. 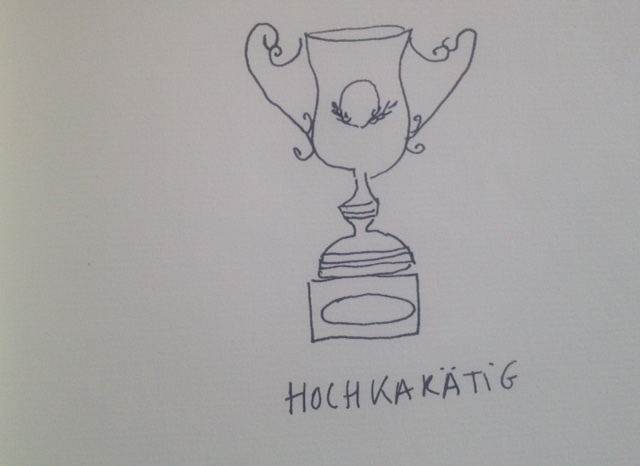 "Hochkarätig!" I snarled while putting down the phone. But on the positive side: I'm sure that in a few months time I can talk about the "hochkarätig" in the arts in a light and humorous way... so the museum might want to get back to me for next summer?